Clean and wash drumstick. Slit them with a knife. Mix all ingredients except oil with drumstick and keep it for 2 hours. Heat oil in a frying pan and fry drumstick in low heat until it become deep golden brown. Remove from the pan and place a paper tissue to soak extra oil. Clean and wash fish. Make the fish half. Put 1 ts turmeric powder,1 ts red chili powder and 1 ts salt into the fish. Mix gently. Heat 4 Tbs oil in a pan. Add fish and fry both side until brown. Remove fish from the pan and set aside. Add remaining oil in the pan. Add onion and fry until tender. 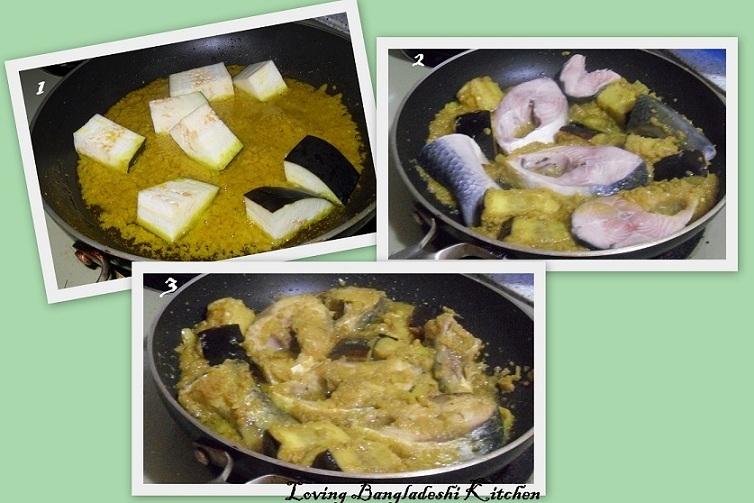 Add the rest of the ingredients except frying fish and stir around 2-3 minutes. Add 1/2 cup water and bring it to boil. Then add the fish, stir gently and cover the pan. Cook until the gravy become thick and then turn off the heat. Your fish curry is now ready to serve. Peel and wash loti. Cut loti 3-4 inch long shape. Put 1 liter water in a pan in high heat and bring it to boil. Add loti and boil it for 2-3 minutes,drain water and keep aside. Make onion and green chili paste and set aside. Clean and wash fish. Mix 1/2 ts turmeric powder and 1/4 ts salt with fish. Put 2 Tbs oil in a frying pan in medium heat and fry the fish. Heat 4 Tbs oil in a pan in medium heat. Add loti and all ingredients and stir. Add 1/2 cup water and cover the pan with lid and wait til all liquid evaporate. Then stir it for around 2 minutes and add 1 cup water. Bring the water into a boil and then add the fish and carefully stir them. Cover the pan and cook until gravy become thick and oil comes out by the side of the pan. Now the curry is ready. Serve with plain rice. Wash and remove the outer green portion of the cauliflower. Boil in a deep large pan around 10-15 minutes in medium heat. Add 1 ts salt while boil. Turn off the burner and do not remove the lid. Allow it to cool. Then serve the curry with khicuri or plain polao. You can fry the boiled cauliflower in little oil before cooking it. You may also bake the cauliflower. After boiling place the cauliflower in a baking dish. Gently spread the gravy over the cooled cauliflower. Bake it in electric oven at 400 degrees for 20-25 minutes. Boil the grated mango in medium heat until it become tender. Heat mustard oil in a pan. Add all ingredients and stir. Cook until the chutney is thickened. Allow it to cool and refrigerate. Cut mutton into small pieces,wash and drain water. Heat ghee in a pan in medium heat.Add half chopped onion and fry until golden brown. Remove from the pan and set aside. Add remaining half onion in ghee and cook until tender. Now add bay leaf,cinnamon and cardamom. Fry for few seconds. Add mutton and all ingredients except yogurt and coriander leaf. Stir thoroughly to mix them well. Cover the pan with lid. Cook until all moisture evaporated. Add beaten yogurt to the mutton and cook in low heat until mutton become tender and all liquid evaporated . (if mutton is not tender add little hot water). Add fried onion to it and cook for 2-3 minutes in medium heat. Then add the chopped coriander leaf on top of the Mutton and turn off the heat. 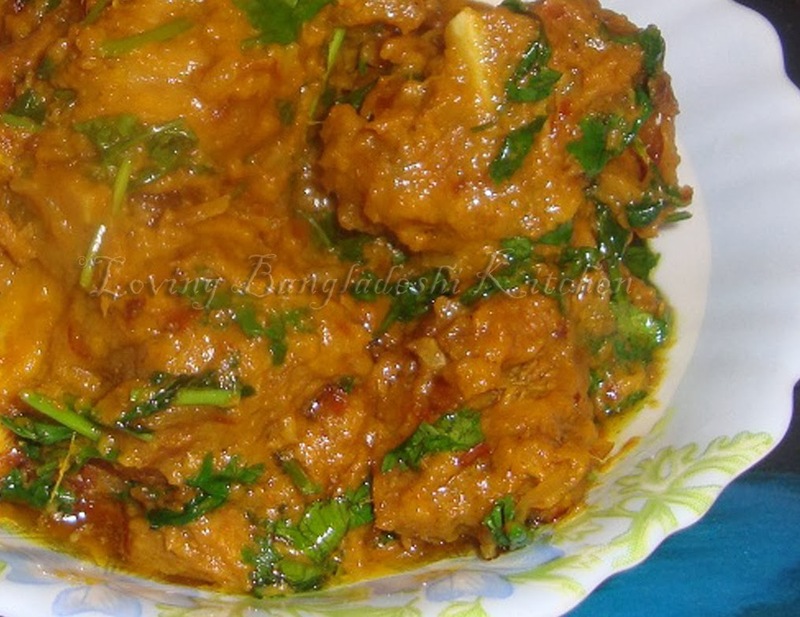 Mutton dopiaza is now ready to serve. Clean and wash shrimp. Remove shell from shrimp. Cut all the vegetables. Add all the ingredients to the shrimp except oil. Mix them well and keep it for 10 minutes. Skew shrimp and vegetables to the skewers closely like one piece shrimp,one piece onion, one piece capsicum, one piece tomato and so on. Take a baking tray. Spray or brush oil over the baking tray. Put the skewers on it and spray or brush oil on the skewers properly. Preheat oven 400 f for 5 minutes. Then turn it to 350 f. Place the tray into the oven for 20-25 minutes. Remove the tray from the oven and turn over the skewers. (be careful if you use metal skewers) Again place the tray to the oven and bake another around 20 minutes or until golden and cooked through. Place all ingredients in a blender and blend it until smooth. Remove from the blender and serve. Wash and peel mango. Cut the mango 2 or 4 pieces in long shape. Remove seed. Poke the mango with fork. Boil water in a deep pan. Add mango. Boil mango until tender. Put sugar in a heavy bottom pan. Add 2 cup water and boil until the syrup become very thick. Remove from the burner and add mango pieces. Leave it in room temperature for 12 hours. Remove mango pieces from the syrup and boil the syrup again. Boil it around 10 minutes. Add mango pieces and cardamom powder. Remove from the pan and allow it to cool. Now your morobba is ready to eat. Heat oil in a pan. Add chopped onion and stir until tender. Add green chili and stir. Add tomato, turmeric powder and salt. Stir well. Cover the pan with lid. Cook in medium heat around 5 minutes or until tomato become tender. Remove the lid from the pan. Add sugar and fry around 2/3 minutes. Place tomato to a serving bowl and enjoy with plain rice. Boil olive (jolpai) until tender. Remove and drain water. Slit boiled jolpai 4-5 times. Put panch foron powder,mustered seed powder,turmeric powder,red chili powder and cumin powder to a bowl and make a paste with little vinegar. Add olive and mix with the paste and keep it aside for a while. Heat oil in a pan. Add whole mustered seed,whole panch foron, whole red chili and bay leaves. Saute it for a while. Add whole garlic,ginger paste and salt, and stir well. Then add olive and all the paste, and mix them. Add vinegar,sugar and stir. Cover the pan with lid. Turn the heat low and cook around 15-20 minutes. Stir occasionally. Remove from the pan. Let it cool and store in a airtight glass jar. To store for long term, keep your pickle in the sun occasionally. Wash rice and dissolve rice with 1 cup water around 2 hours. Roughly break rice with hand. Heat milk in a heavy bottom pan. Bring milk to boil and then turn the heat in medium. Add rice,carrot and cardamom. Cook until milk become almost half. Stir occasionally to prevent burn bottom of the pan. Add condense milk and sugar. Cook another 10-12 minutes. Add saffron and stir. Cook again around 5 minutes. Remove from the pan. Let it cool and serve. Peel and wash bottle gourd. Chop thinly. Heat oil in a pan. Add onion and fry until tender. Add green chili and stir. Add chopped bottle gourd and stir. Add turmeric powder and salt. Stir thoroughly to mix all of them. Cover the pan with lid. Cook around 10 minutes in medium heat or until tender. Remove the lid and fry another 3-4 minutes. Take the chicken stock in a sauce pan and bring it to a boil,then add lemon grass, mushroom, green chili and if you are using chicken breast add it and keep it in a lower medium heat to boil. In the mean time beat the egg yolk, then add the corn starch and mix it smoothly with egg yolk and set it aside. Then add sugar, vinegar, ketchup, chili sauce, salt in the stock and stir it well. Now take the egg yolk mix and add 5-6 Tbs stock from the saucepan and mix it smoothly with egg yolk. (it is important to do so because this will help to adjust the temperature of egg yolk mixture; otherwise when you add this into the soup it may get clotted and your soup may not be smooth). Then stir the soup in one hand and carefully add the yolk mixture with other hand. Stir the soup continuously to make it smooth. When it is done add the shrimp, bring the soup to boil and then turn off the heat. Clean and wash the fish.Slit both side of the fish with knife. Put 1 ts salt,1 ts red chili powder and 1 ts turmeric powder in a bowl. Add a little water and mix well. Add the mixture to the fish gently. Heat 4 Tbs oil in a large pan. Add fish. Fry the fish in lower medium heat until golden brown. Fry both side of the fish well. Carefully handle the fish when you turn over. Remove the fish from the pan and set aside. Add 2 Tbs oil in the pan with remaining oil. Add chopped onion and fry until tender. Add tomato and fry around 2 minutes. Add the remaining ingredients and stir. Add 1/2 cup water and bring it to boil. Add fried fish to the pan. Spread the gravy with a spoon over the fish. Turn the heat low. Cover the pan and cook around 5 minutes. Remove the fish from the pan to a serving dish and serve. The best way is to roast the eggplant on top of the burner. In this way carefully turn the side and roast all the side of eggplant. 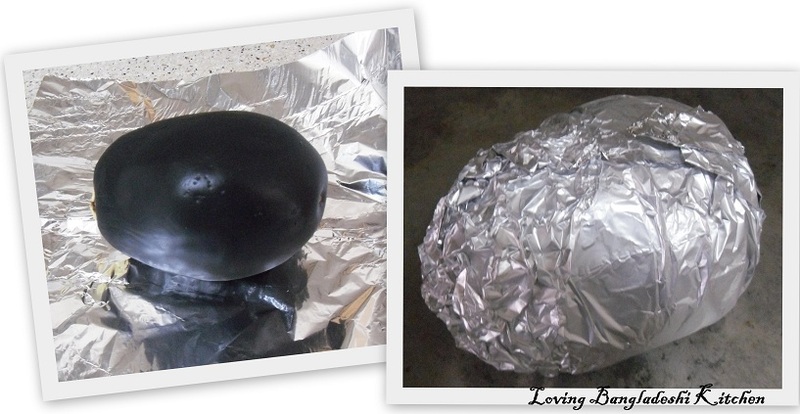 Roast it until the skin seems roast and inside of the eggplant become soft (be careful about your fire alarm because this process may switch on the alarm ). If you do not have the above two option than you can bake the whole eggplant to make it soft. In this way first prick the eggplant with a fork and bake it in a preheated oven at 400°For until it become tender or until the flesh yields easily to pressure. In this recipe, we have broiled the whole eggplant. First wash the eggplant and soaked the water from the outside with a paper towel and then brush around 1 Tbs oil all over the eggplant and cover it with foil paper and broil it in the oven for around 40-45 minutes or until it become soft in the inside. Turn off the oven and keep the eggplant to cool down. Then peel the skin, mash the flesh properly. Add onion, chili, salt and coriander leaf, and mix them properly. Cut chicken into 1 and 1/2 inch square shape.Clean and wash it. Add 2 Tbs corn flour,flour,half salt,half pepper,1 ts soy sauce and beaten egg to the chicken. Mix all of them well. Heat 1 cup oil in medium heat in a pan and fry chicken pieces till golden brown and place in a paper towel to remove extra oil. For manchurian sauce heat 3 tbs oil in a pan in medium heat.Add onion,ginger, garlic and fry it till light brown. Add green chilli and coriander leaf and cook for 1 minute. Reduce heat and add chicken stock, remaining soya sauce, salt, sugar, remaining pepper, ajinomoto(tasting salt) and bring it to a boil. Add fried chicken in the stock and cook around 5 minutes. Mix 2 tbs cornflour in 1/4 cup water and add this to chicken.Cook for another 2-3 minutes. Chicken manchurian is ready and serve it hot. Wash the fish pieces and set it aside. Heat oil in a pan in a medium heat. When oil is heated enough put all masala (onion paste, garlic paste, chili paste,turmeric powder, cumin powder, and salt) into it and stir it . 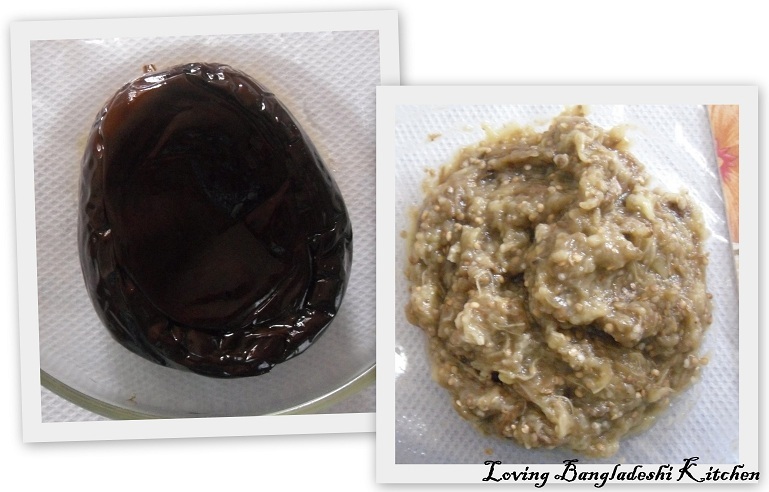 When oil is started to separate from the masala put the eggplant in it. Stir the eggplants until they become little soft. Then add the fish pieces and carefully mix it with masala so that all pieces are coated with masala. Keep it for few minutes(around 3-4 minutes) and then add around 1 cup of water and bring it to a boil. Now cover the pan and let it cook for around 15-20 minutes. In the middle of time carefully flip the side of fish, add the tomatoes and spread the coriander leaf on the curry and cover it again. 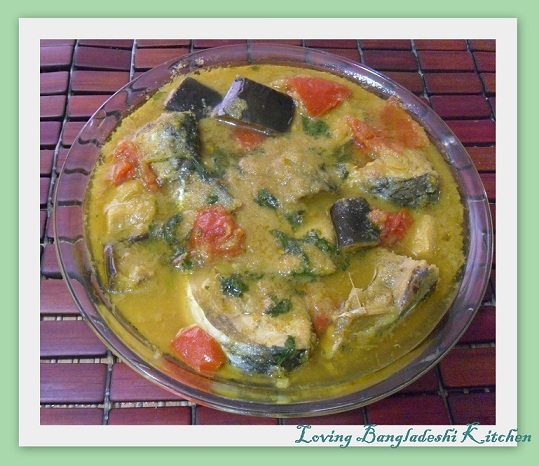 When the fish are cooked turn off the heat and enjoy it with plain rice.